How is your week going? I am so glad that this week is another short work week for me; I am exhausted/drained from the holidays!! Monday was really rough getting up early for work (I fell asleep on the couch when I came home, LOL! ); It is also especially hard, since Mike has this entire week off. Today is my last day of work for this week *woot* then Thursday and Friday Mike and I are going to do some major organizing in the garage (I know it is very disturbing that this gets me excited)!! My OCD is showing, I know. Mike is also planning on turning our hall closet into a pantry for me (hooray!!). I get so frustrated trying to put away all my stuff from Costco in my "little" kitchen cupboards; I am going to order some of these (which really make me happy!!). I will post before and after photos~hopefully my hubs will start the project today (since it is suppose to rain all day). Here is a quick project I made for the Hospitality Teams at church (which I am currently in charge of). I totally copied them from Nancy (since they were so super cute??). 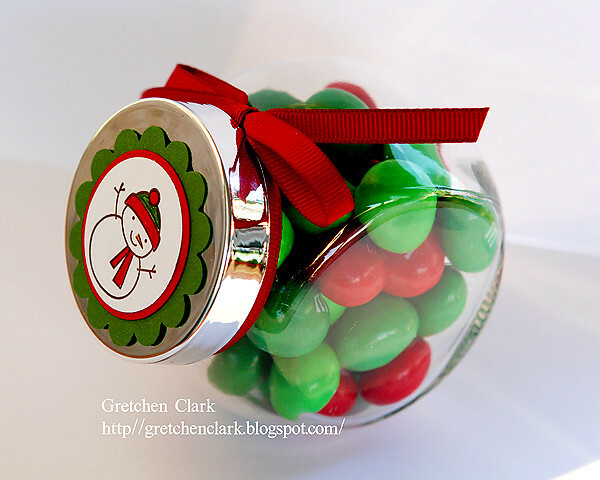 I can see more of these spice jars in my crafting future...I am thinking Valentine's Day!! 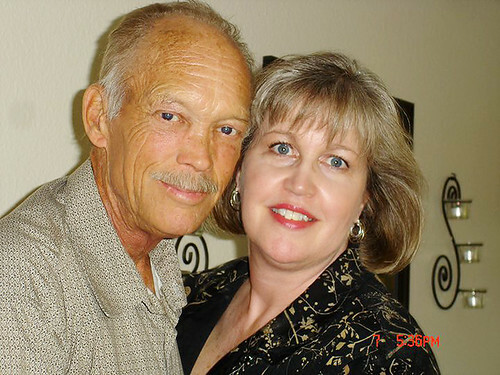 My very dear friend, Cindy, lost her best friend and husband, Mark, on Christmas Eve. Mike got the call early on Friday morning, and I just sat in disbelief that entire morning (and most of the day). While we know that Mark is now in heaven and no longer suffering~it is still hard for all the people he left behind. I cannot even imagine what my friend is experiencing!! Please keep her in your thoughts and prayers, as she makes arrangements this week for the funeral. Big Hugs to you Cindy!!! I hope you had a great Christmas!! Our family enjoyed our usual family traditions, which consists of staying in our jammie's pretty much all day, eating lots of yummy food, watching movies, and just enjoying each others company. 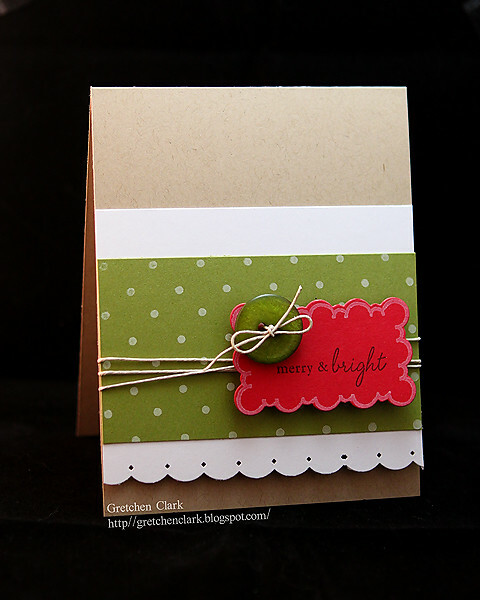 I do have some stamping goodness to post this week, but I am trying to get back into my normal routine. I am back to work today, so that should help me get back into the swing of things. So in the meantime...here is a picture from Christmas Day; Hershey got some new bowls from Nate's parents (who live near Hershey PA)...SO Cute!!! 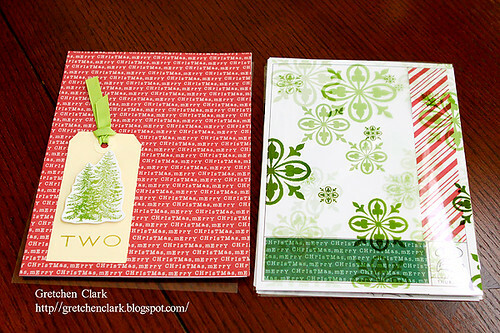 I can not believe it is Christmas Eve~boy this year has really flown by!! I think I am all ready for the festivities (and if I forgot something~well, it just isn't going to get done); I am kinda doing the "go with the flow" thing this year (which has been quite interesting for me). I am currently reading this book; and I hope to simplify my life a lot more in 2011! 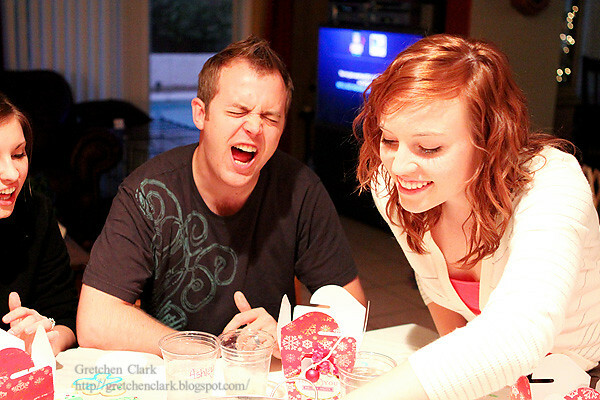 On Wednesday Ashley came over to "pretty" up some gifts she made for the worship team at church. Of course I was excited to help out!! 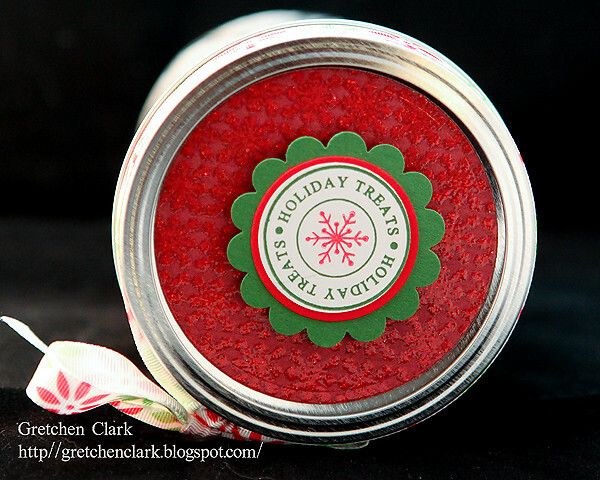 She made some of this (which I absolutely LOVE~YUM!! 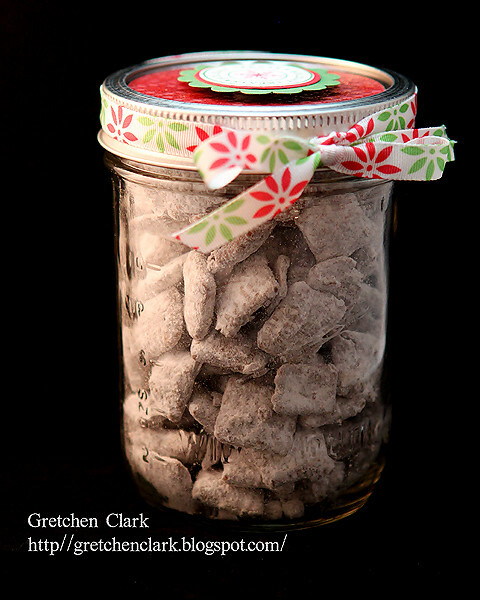 ), and packaged it up in a mason jar (don't you just love mason jars??). 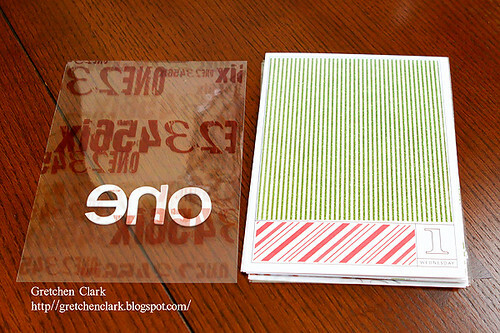 I used my new circle Nestabilitie dies to cut a circle for the top (which was the perfect size); out of patterned paper, and used my Holiday treats stamp set (love that set!! 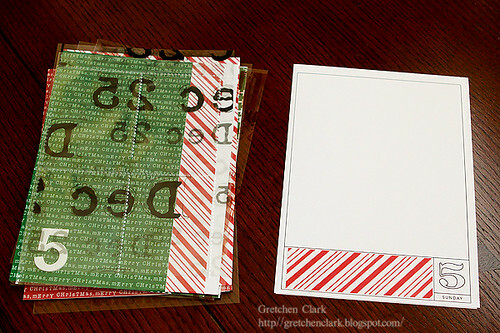 ), to make some tags for the top. Ashley picked up this cute holiday ribbon at HL, so we tied a bow around the lid (gotta have ribbon!!). I think they came out pretty cute *wink*; and since Mike has been helping out with the band, he got one...and I ate the muddy buddies already!!! 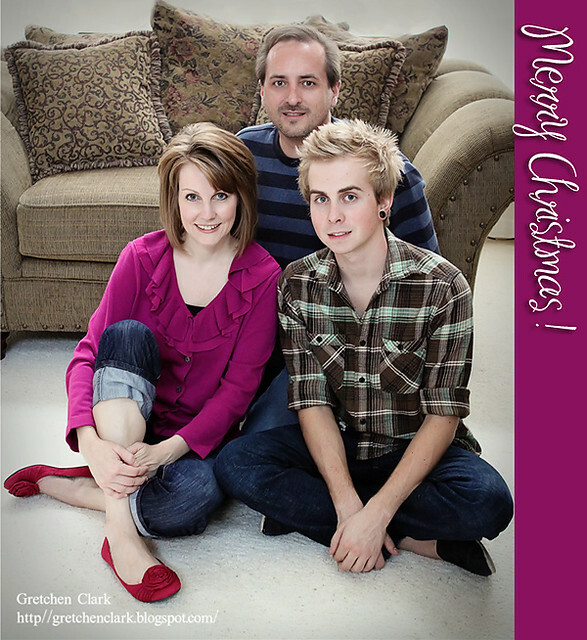 I want to wish you all, my sweet blog readers a very Merry Christmas and Happy New Year; from my little family!!! How is your holiday planning/shopping coming along? I think I am just about done (one more trip to the store today, and a few groceries and I think that is gonna be it~whew!). 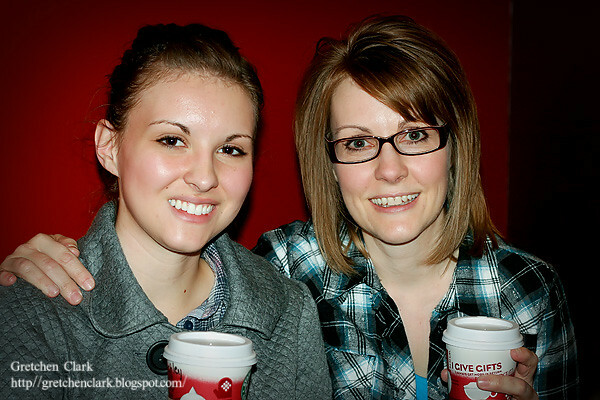 We had our office Christmas party yesterday, and I actually brought my camera~I try not to be quite the paparazzi I am with my kids~but I got the ok, so you don't have to tell me twice, LOL!! 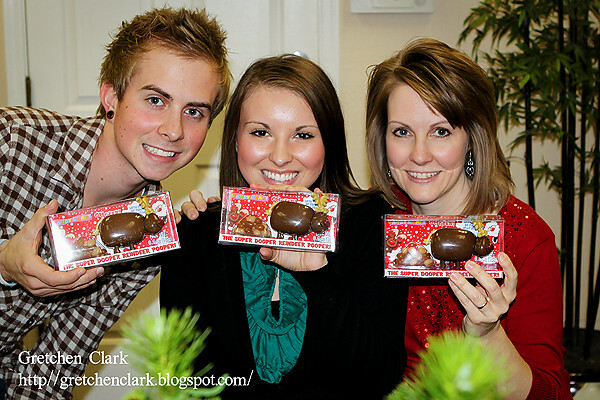 Thanks Scott for snapping this one of Josh, Ashley and me with our "Super Dooper Reindeer Pooper" dispensers, LOL!! I am off work until the 27th, and I am thrilled!! I really wish I could be concentrating on my DDA, but I will have time to print photos, journal, and hopefully complete it next weekend *fingers crossed*. I will post pictures once it is done; I have been faithfully recording my daily happenings, so I don't forget things (old age is setting in, LOL! ); I am excited to get to the finished product!! 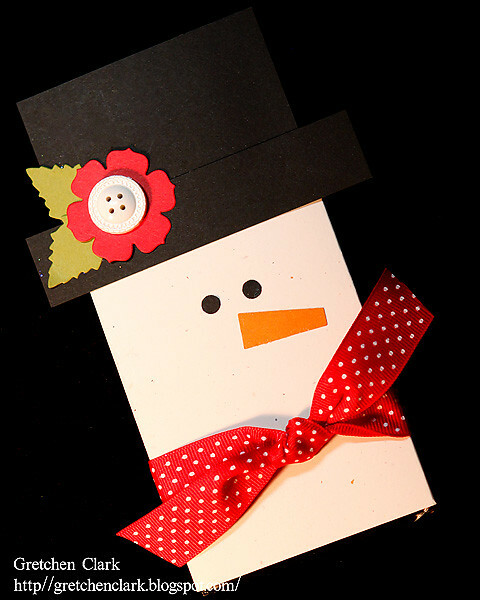 Here is a quick card I made a few days ago. I just love old olive (SU!) 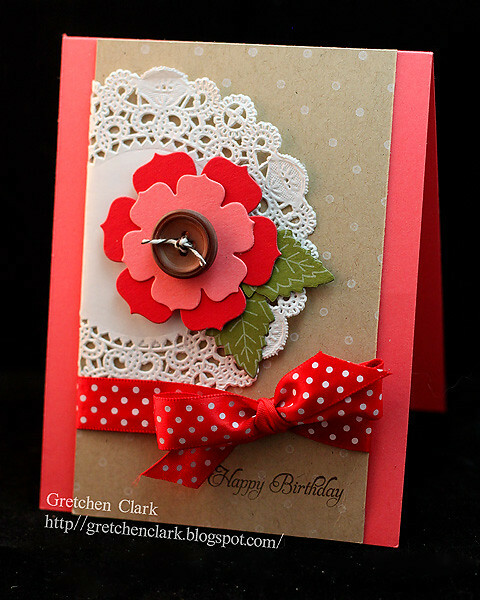 and Pure Poppy (PTI) cardstock together!! So Christmas~ie!! As you can see...I never made it back to post *sad face* on Friday; it sure has been a crazy weekend (but isn't that how December usually is??). 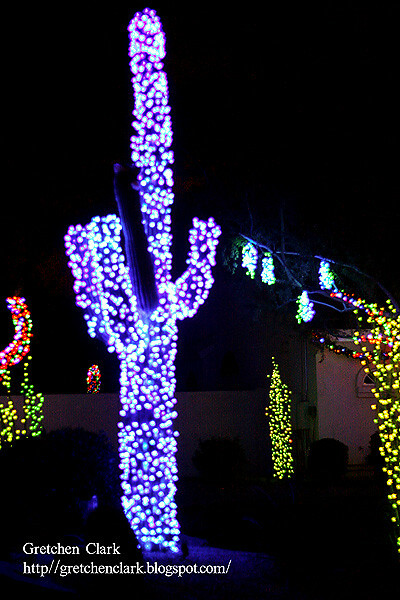 Friday night Mike and I went out for dinner, then picked up Ashley & Nate for some Starbuck's and Christmas light crusin' (I just love how people decorate their cactus' with lights!!). It was a fun night! Saturday my to-do list was a mile long...but I am happy to report that I have only 2 things left to complete, which I hope to cross off tonight...then I can make a new list, argh!! Last night the kids/teens from my church put on a musical called "Back to the Manger"; it was such a great performance and can you believe I snapped 217 photos??? Crazy, I know! I just loved watching the kids do their "thing" and convey such a powerful message!! 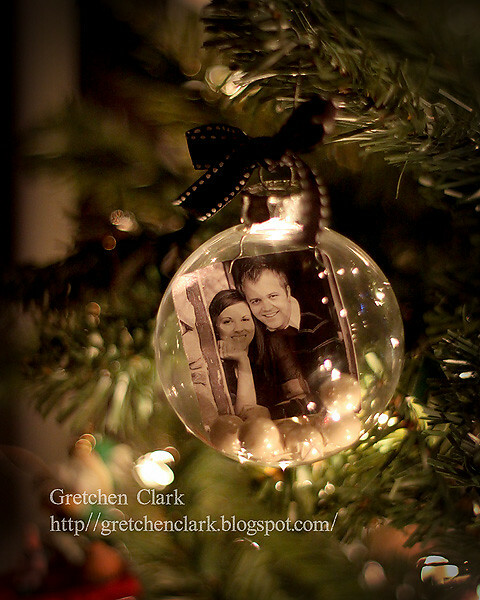 I saw a blog post a while back on making cute photo ornaments; and since I am a "clickin mom" I was all over it!!! I had a few moments last night to whip one up, so I could have something to post today, LOL!! 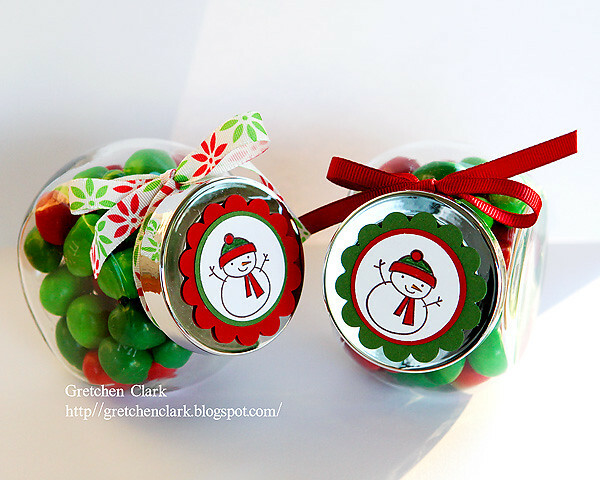 They are super easy (and inexpensive) to make!! I just resized a photo to 1.5 x1.5 inches, cut it out, rolled it gently and put it inside a clear ornament (along with some garland), It did take me a while to get it positioned the way I liked it (I just used a pencil (eraser side), to move the photo around inside the ornament). Then just tie a bow one the top, and that is it...it is ready to hang on the tree. In the mean time, I thought I would post this old photo of Ashley and Josh; it seems like yesterday that they were this little. Every year we would cut down a small tree, and they would take turns having it in their room. They would use colored lights and lots of fun decorations. 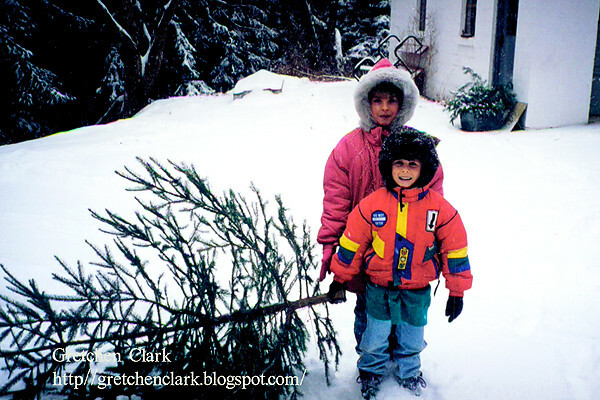 Here they are at my mom's old house getting their special tree (it kinda looks like a Charlie Brown Tree, LOL!). Happy Friday!!! See you soon. Am I the only one that thinks December is flying by? Can you believe that Christmas is 10 days away? YIKES!! Today's post is gonna be a quickie! 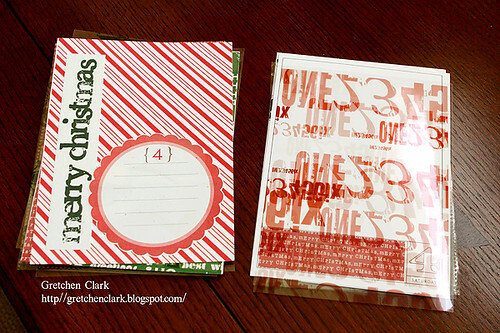 Here is a quick project that I made last week...very quick and easy (my favorite kind of projects!!). I usually like to have some small gifts on hand during the holidays, just in case you need one at the last minute; So I whipped up a few of these guys/gals. 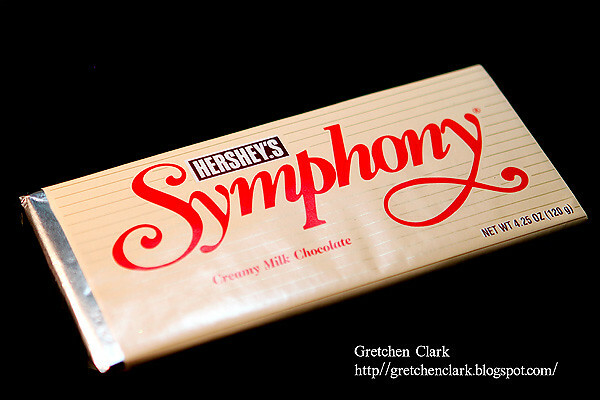 And if I don't use them~I am sure the chocolate bar will NOT go to waste, LOL!! As Christmas is creeping up on me~I am going to do my best to post on my regular days...but I may miss a few posts, due to the hustle and bustle. Happy Today!!! (a little late!!). This weekend was a whirlwind! I was busy, busy, BUSY!!! 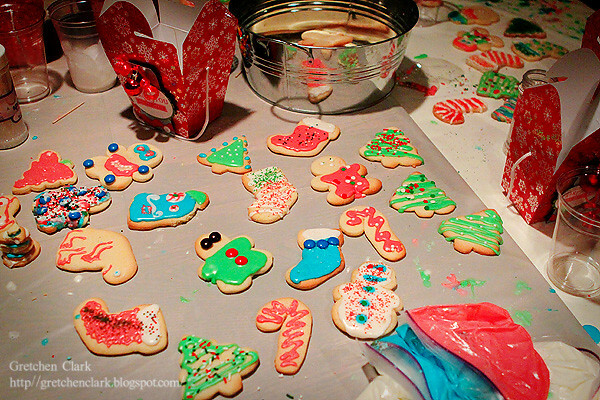 I did however have a fun time at my church's Women's Christmas Party on Friday night, got my out of town packages wrapped and boxed up for shipping (mailed most of them today *woot*), my Christmas cards written, and had a very FUN cookie decorating party with my kiddo's and friends! 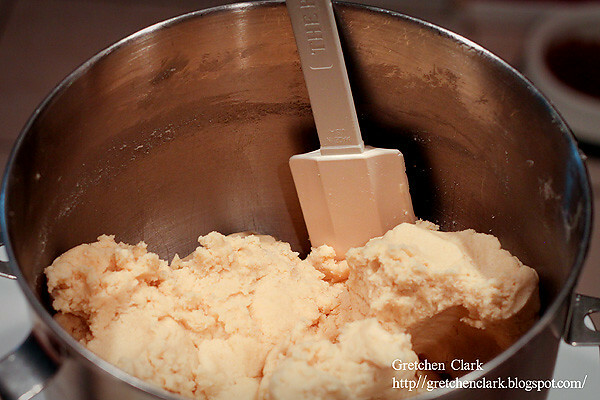 Ashley and I baked up a TON of sugar cookies on Wednesday, so they would be ready for the party on Sunday~let me just say "I ate way too much cookie dough!!! 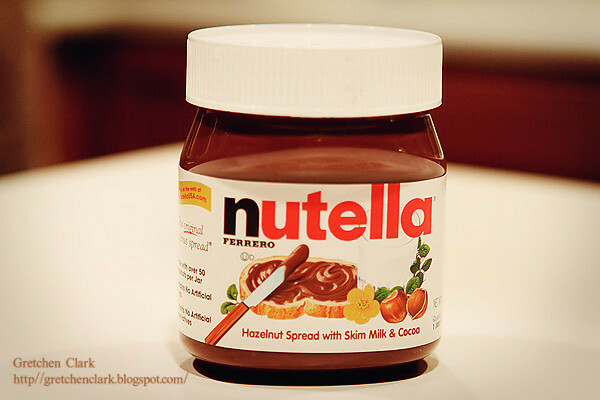 That stuff is like CRACK to me!!". Here is a photo of the delish'ousness!!! 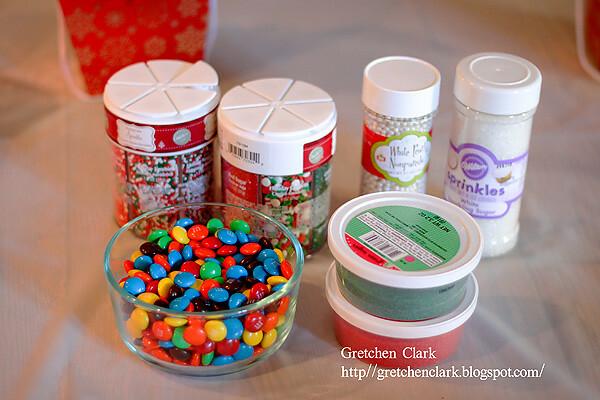 Of course you have to have some fun sprinkles, sugar, and candy for some "fancy" decorating!!! Everyone got in on the fun~I was surprised that even the boys had a good time!!! Here is Nate singing a Christmas carol at the top of his lungs~I cannot remember what song it was for the life of me~but we all enjoyed the serenade!! My hubby even took a few moments out from his football game to join in the fun~Now that says a lot when his favorite team is playing!!! There were so many cute cookies!! It was fun to see everyone's creativity at work~here are a few or the masterpieces. And of course they needed a container to bring home all their creations in!! 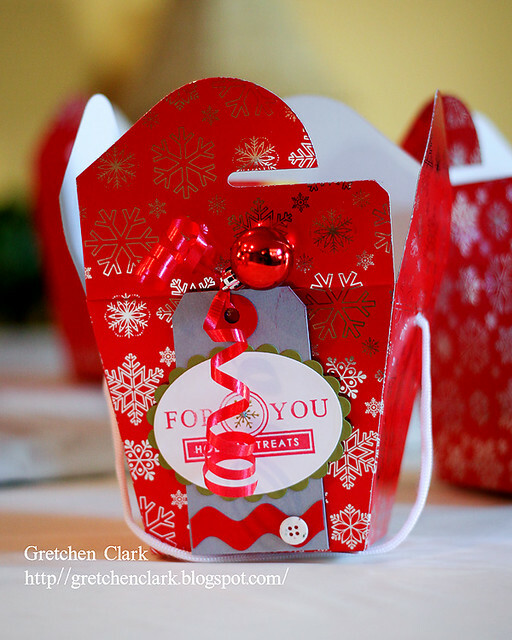 I found these cute take out boxes at the Target dollar spot, and pulled out my Holiday Treats stamp set and made a tag for each box. Then just added a cute little ornament (also from the dollar spot), and some curling ribbon~viola! 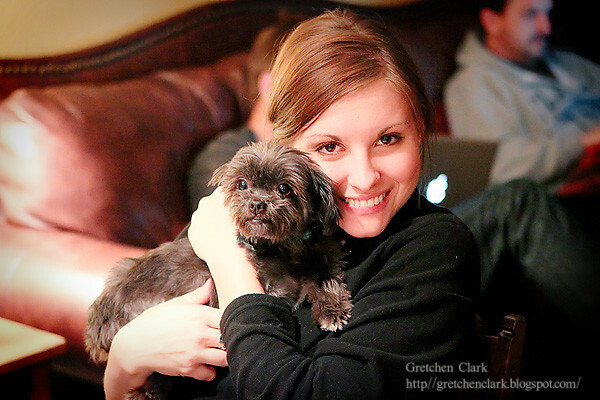 And last but not least~my favorite "little dog" Hershey came to the party too!! I shared some frosting with him...because he is so stinkin' cute!! And who can say NO to that cute face??? He and Kodi are starting to make some progress in "getting along". Hopefully by Christmas they will be best of buds!! Kodi just has to realize he is 45 pounds and Hershey is 5 (although he (Hershey) doesn't know that, LOL!! He thinks he is a big dog the way he goes after Kodi!). See ya a little later!! Last night everyone came over for dinner and haircuts (do you think I took photos for my DDA?? Nope~it got too crazy, LOL! we may have to recreate the evening so I can photograph it, see I am going with the flow with my DDA *wink*). A friend of mine is celebrating her birthday today, Happy Birthday Cindy!!! 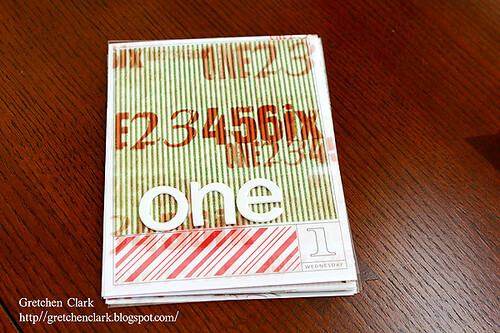 ; so on Monday afternoon, I had a few moments to play with my stamping stuff *smile* Here is the card I made for her. I didn't get much cleaning done, but I am pretty much done with my Christmas Shopping~*woot woot* All I have left is to pick up is gift cards (one of my favorite types of gifts to give and get!!). I have today off from work today *another woot woot* since I am trying to use up my hoarded vacation time. One of my goals today...to get my naked tree decorated. 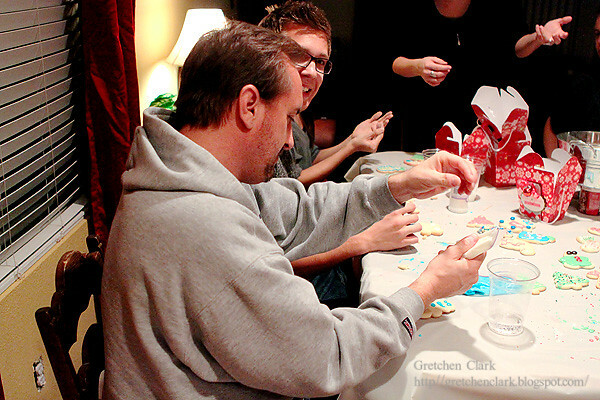 Each year Ashley and I (and the boys, if they are in the mood) decorate a gingerbread house/make cookies; when they were little, Ashley and Josh LOVED decorating cookies (the more sprinkles the better)!! 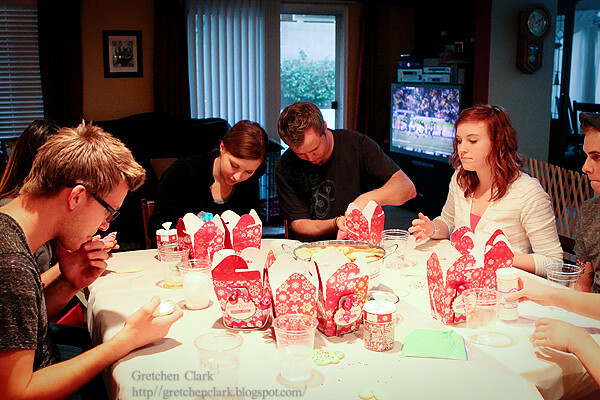 I thought it would be fun to have a "cookie decorating party" this year for Ashley & Josh and a few of their friends (plus it will give me another page in my DDA, LOL!). So on Saturday night I put together a little invite for them to give to 3 of their friends (Lindsay~wish you were going to be in AZ to join us!!!). It was fun to use my digi supplies!! 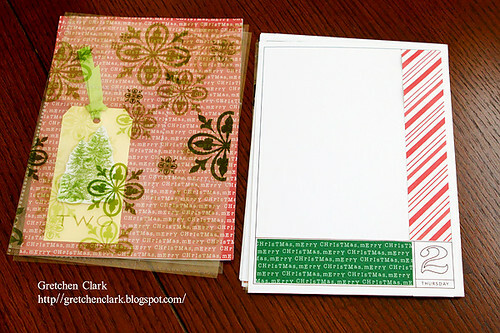 I think I am going to try to do more scrapping in 2011 (I kinda miss it!!). 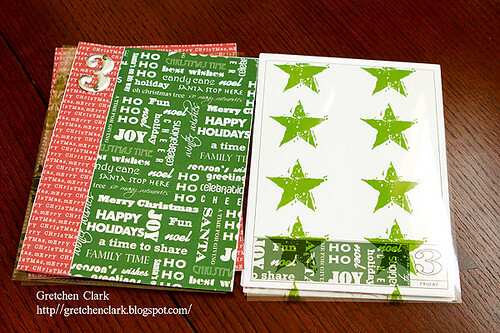 I used the kit "Deck the Halls" (purchased from Digichick in 2009) I couldn't find the same kit I have, but the mini one is here. 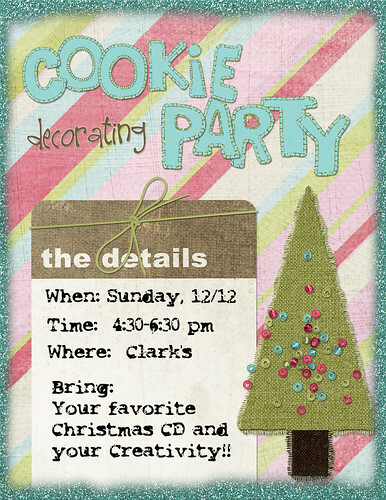 Here is my finished invite. You can download one here if you'd like, just bring it into photoshop to add your info, or hand write it in. Of course pic's will follow!! 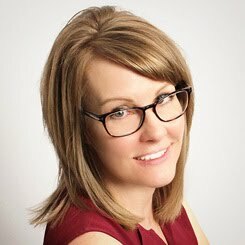 I have been a long time follower of Ali Edwards (LOVE HER!! ), she is a scrapbooking genius IMO!! I love how she puts her pages/journaling/transparencies all together to tell a wonderful story of daily LIFE!! I have been drooling over her December Daily Album (DDA) this year, and was contemplating if I should take on this task...isn't December already hectic enough without adding more pressure??? But since I love scrapbooking (my first love, before stamping), and I LOVE photos; I bit the bullet and purchased her templates. Of course I wanted to make my book just like hers...but everything was pretty much SOLD OUT (darn all those DDA participants!! 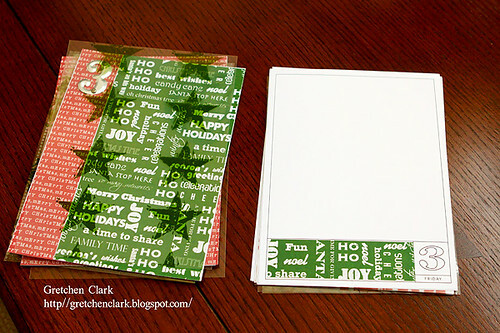 ), so I figured I would use my creativity and use Ali's book as a template (much more fun that way too!! ), so off to Joann's, Michael's and Hobby Lobby I went gathering supplies (how fun!). My next thought was "will I have enough stuff to scrap about???" since my kids are young adults now...but the creative juices started flowing and I think I will be ok *wink* I have never scrapped pages first and then added photos/journaling, so this was a new concept for me to get my head around (I think I will like it though!!). Even though I am pretty busy with work, church, Christmas shopping, etc. I am keeping a small notebook handy to jot down my thoughts for each particular day; that way if I don't have time to get the day scrapped right away, it is no big deal! I may end up scrapping the entire book at once~but that is ok~I am letting myself go with the flow!!! 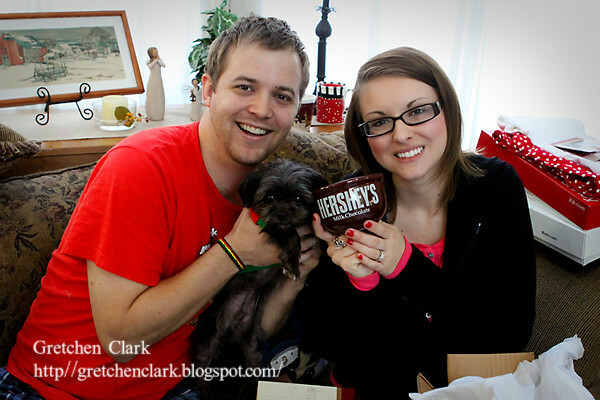 I am excited that I will have December 2010 documented for my family!!! I may just make this a Clark tradition ;) It's not too late to start one~will you join me in being a family storyteller??? I will have a larger post later today...with photos of my recent December project (I am thinking I may have bitten off more than I can chew, LOL!! just kidding). Last night instead of photographing my project, I was sitting on the sofa with my hubby (in our jammies), watching this and this, while eating nutella with a spoon, right from the jar~YUM!! Have you ever tried this stuff??? I don't ever buy it; because it is soooo DELISH and tempting (that is why I had to eat it all last night, to get it out of 'da house' *wink*). see ya in a bit!!! random chit chat...and cannot believe that I won!!! This week is zipping right along *smile* I don't know about you, but I am having a really hard time getting into the Christmas spirit this year. 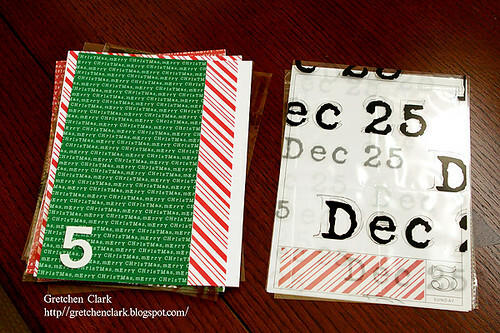 Usually by this time I am almost finished with my shopping, my tree is up, and I am getting ready to decorate cookies; but this year I have none/zip/nada of that accomplished yet (granted it is only December 1st today, but someone with a type A personality gets a little stressed out by this sort of thing, LOL!). I think the biggest obstacle for me this year is that we are cutting back on our spending this holiday season, and since gift giving is my love language, I want to make sure that I get the perfect gift for each recipient with the limited amount of Christmas funds. Not an easy task. I hope to, at least get my Christmas list (in Excel, LOL!) finished today, so I will have a starting point. 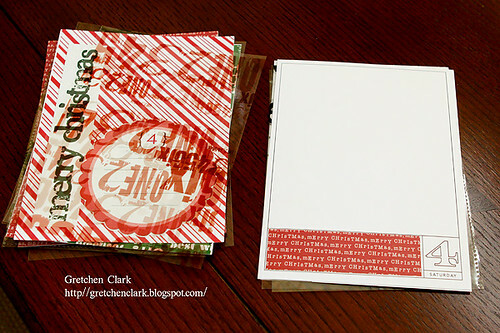 I have also taken on a fun holiday project that I had hoped to post about today, but it wasn't quite blog ready yet. I will be working on it today and tomorrow, so hopefully by Friday. (Pictured above the On the Go Bag). A few weeks ago I was the winner of a cute prize!!! *woot woot* Seriously, I could not believe that I won, because, well...I never win!! 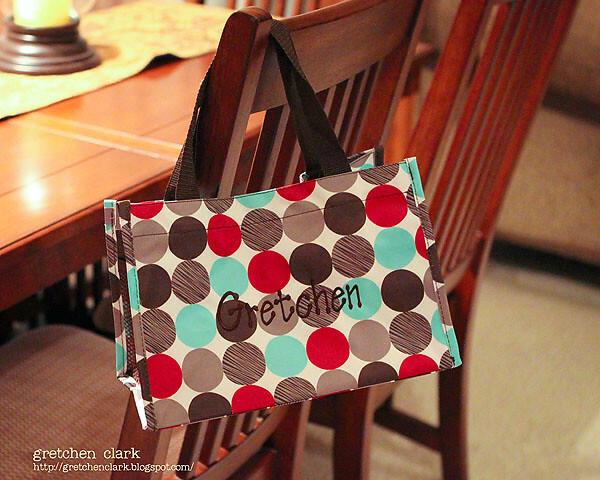 Have you heard of Thirty One??? If not, you need to check out the website, because they have the cutest stuff (online catalog here)!!! It is reasonably priced too!! I plan on getting a few of my Christmas gifts there as well!! Aren't the lunch bags super cute?!!! It will be hard not adding a few things to my order for myself!!! Tiffany is awesome to work with too, just contact her if you want to place an order or have any questions!